Well I promised a more positive post and I'm happy to say things are back to how they should be this time as it'll be all about Rosie rather than me and my silly wobbles! Thankfully she's provided me with plenty of positive ammunition! First off is her advancement in copying – for a while we wondered if things were registering at all after many unsuccessful attempts to get her repeating things. Finally this week she made a real breakthrough. 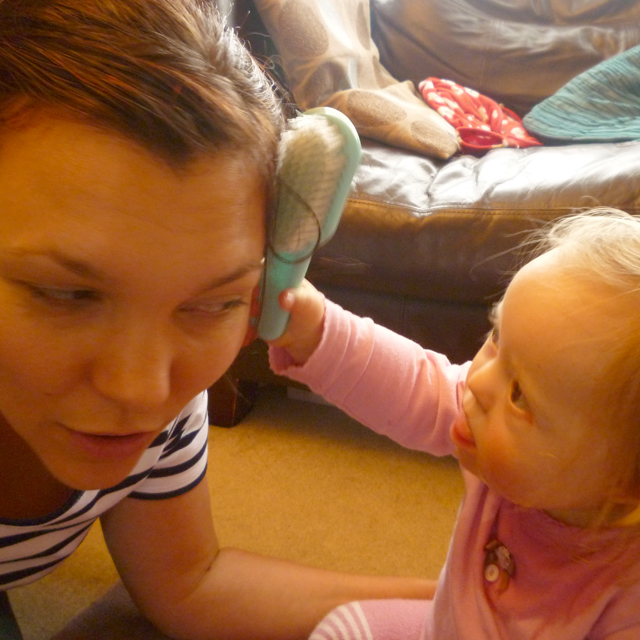 Karen was brushing Rosie's hair, then she handed the hairbrush to the Bud and she returned the favour, by gently brushing Karen's hair, taking great care not to hurt her in the process. To prove it wasn't a fluke she did it again (to show me) as I returned from work. 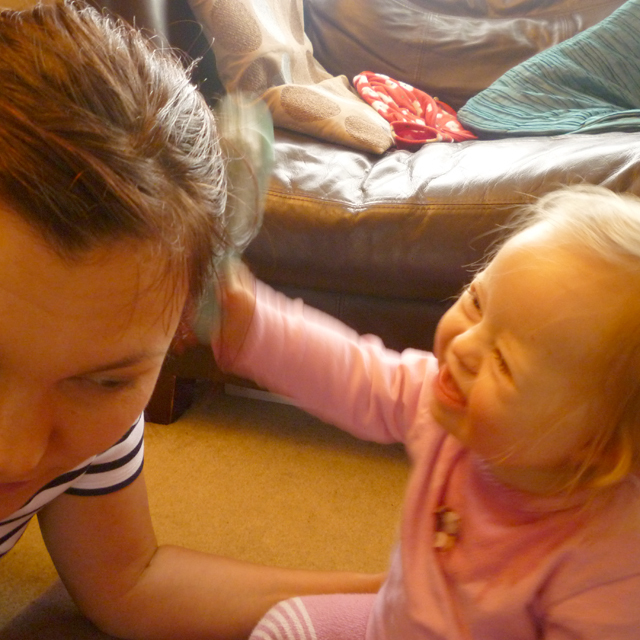 I think we can now add hairdressing to the ever expanding list of possible career paths for the Budlington! 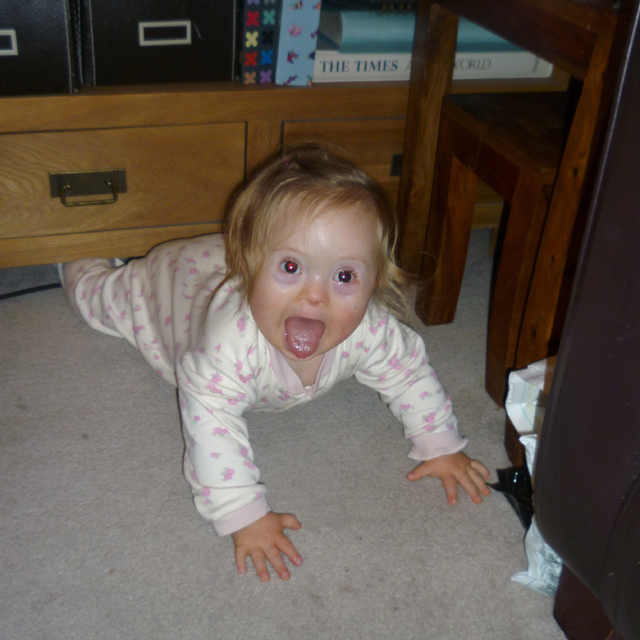 Rosie has also discovered how to move around a bit – for a couple of weeks she's been able to turn around full circle on the spot whilst on her bum – but just this last few days she has discovered how to shuffle backwards! I don't think it was intentional at first as she was aiming to grab my phone which was in front of her! However, her enthusiasm and excitement resulted in pushing herself backwards half way across the room! - I've tried to capture this in an animated file below (only thing missing is a bit of Benny Hill music!). The next day Karen had left Rosie in the middle of the living room floor whilst she went to open the front door to me (I'm forever forgetting my house keys) and when we entered the room we found her wedged under the bookcase! I didn't anticipate this day would come so soon where we have to keep a constant eye on her. Rosie has also made an advancement on her sit ups (as mentioned a few weeks ago). She now grabs our fingers and pulls herself up into the seated position, we then raise our arms as she continues to hold on and lift her into an upright standing position which she holds for about 10 seconds. She can't balance herself yet but it's a big step forward seeing her lock her legs straight and allowing weight on them. Needless to say we are celebrating each of these achievements with her and are extremely proud of her continued efforts. 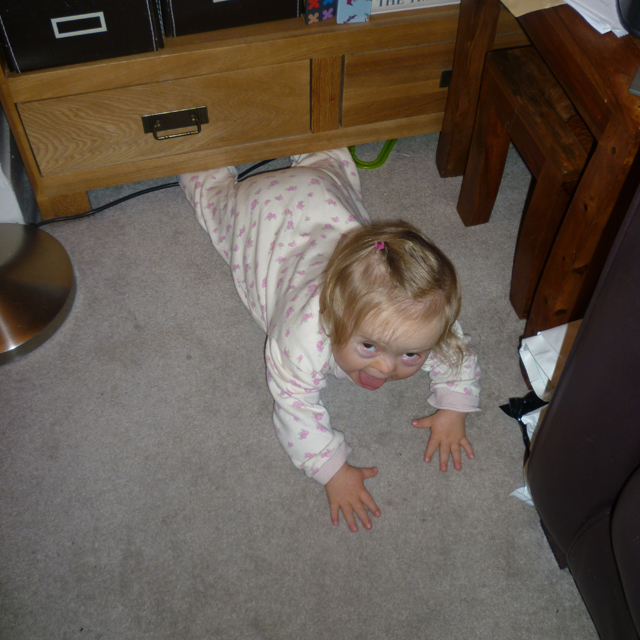 It is so funny when they back up under the furniture- baby always looks surprised to be there! I think you might be right Rachel! WAHOO! What GREAT achievements this week! Way to go sweet girl! Keep it up! You are going to do GREAT things and you will make your Parents so VERY proud of you! You have such a beautiful smile! I love the one of you stuck under the bookcase! You are so VERY cute! Keep practicing your straight legs AND your backwards crawl...you will get better each day! Much love to you all from Utah! Brilliant news. Just wait till she gets on her feet Tom. I'll always remember when Daniel took his first steps. I was at work when Cath called me to tell me he'd managed a few steps on his own (he was quite delayed). The Xmas Market was on in Albert Square in Manchester and I went out at lunch time and celebrated with a gluevine! I was elated. All parents are overjoye when their children reach milestones but I'll let you and Karen into a little secret, there's something extra special when our children achieve each first. And do you know what, that joy never diminishes. 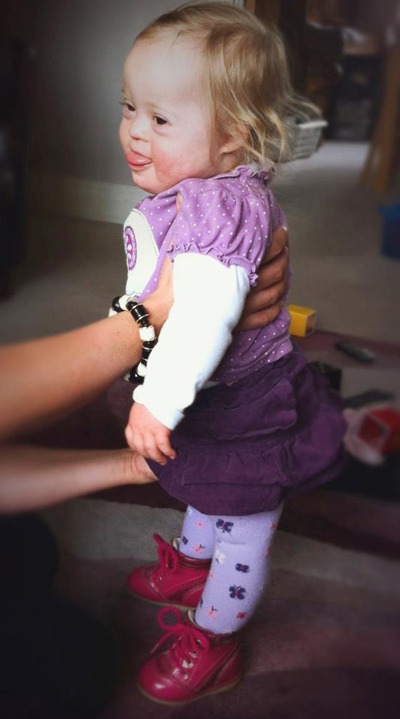 It's one of the many great things about having a child with Down's syndrome. One of the many great things indeed Laurence! Thanks for your message. Lovely image of the Manchester market celebrating with a Gluwein, I like that. I'm hoping Rosie gives me something to celebrate with around that time - I need an excuse to visit them again this year! Big love to Daniel and the rest of your clan. Thanks for sharing this is heartwarming.